Earlier, we briefly looked at John's experience with the crew that mapped the Merrimack. He was not of the Harvard experience. Later, John would go to Nantucket on an invitation (we first learned of this in 2011). R.A. Douglas-Lithgow had a few things to say about John in his book on Nantucket. It is nice that the little island had such a illustrious author writing its history. We will be looking more at R.A.'s work. 03/01/2019 -- John's record at WikiTree: https://www.wikitree.com/wiki/Gardner-49. We are building a index by images at our portal to truth. In preparation for publishing an new issue of The Gardner Annals, I have been reviewing the 11 years (1908-1918) of The Massachusetts Magazine that was founded by Dr. Frank and friends. There is an author who appeared in Vols III through V. Who was he? 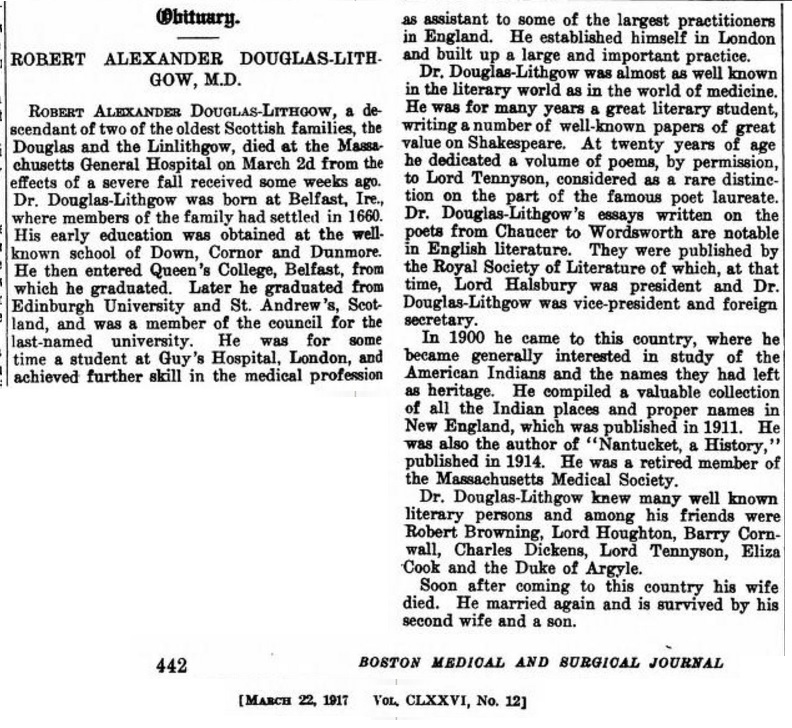 R.A. Douglas-Lithgow, M.D., LL. D.
In several of RA's books, the cover page had a photo and brief summary of his associations. 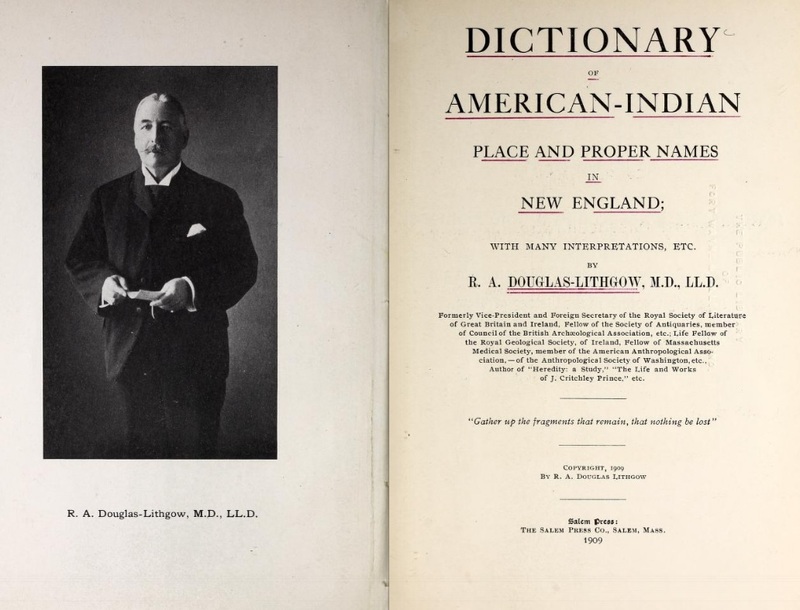 This is an example from his book on American-Indian place names (archive.org). He wrote a book on Nantucket (archive.org). RA wrote a lot. But, again, who was he? I found this at a discussion site related to the Lithgow family (see boards[.]ancestry[.]com). Despite the extended time lapse since your request for information regarding the ancestry of your grandfather, Robert Philip Augustus Douglas Lithgow, I have a few items regarding the extant British branch of the family which may be of interest. 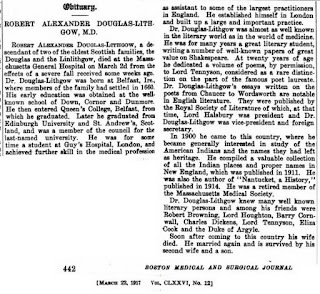 Very briefly, your great grandfather was Robert Alexander Douglas Lithgow, born in Ireland, a physician in England, who emigrated in later life to Boston USA. He died there whilst your grandfather was still a child (at school in England?). He wrote poetry and several books on American history. The male line of our earlier Lithgow ancestors is documented (without dates) in the Northern Ireland Record Office and is frequently referred to in these Ancestry community postings by other descendants now living in America and Australia. Thomas Lithgow came from Lanarkshire in 1610 and settled in County Derry. I can fill in more details regarding this British branch of the family but have not yet thoroughly researched the early Lithgows who emigrated to America and Australia and about whom you requested information. After much searching, I found one biography that deals with his work in England (Men and women of the time). RA was born in 1846 in Belfast. He settled in London for medical work. And, he came to American later in life. But, none of this looked at his literary work. The American Historical Association (1912) noted three articles on New England houses. So, on further search, the New England Journal of Medicine mentioned an obituary. On looking further, I found it in The Boston Medical and surgical journal (pg 442). We will get a full list of RA's publications plus gather more information about his work. Too, we will be looking at all of the authors in Dr. Frank's publication. 12/05/2016 -- R.A. to several issues of the TMM. We introduce him in the Gardner's Beacon and will add a little more about his work in The Gardner Annals. 10/30/2018 -- The Gardner Annals, Vol. IV, No. 1 provided the Table of Contents for the last five volumes of The Massachusetts Magazine. These have been printed in one bound volume. Last post, we mentioned a lonely grave. It is in Nebraska. This is a photo. As suggested, it's out in the middle of nowhere. And, the type of cemetery is a common thing in this part of the country. People drive by, at a high rate of speed. The stones sit. But, this is not entirely wilderness. It is highly productive farm land. Back east, settlement was dense, in terms of area being covered. Essex country in Massachusetts has no really open areas. That is, everything is identified by one of the communities. Granted, through time the boundaries of those communities changed, say as new ones were defined. But, no place was left untouched by human feet. Out here, it's wide open. The past century plus, things have been mapped. We have counties that cover the territory. These collect into states. And, given the recent situation (for instance, look at the red/blue map by county), these areas, and their residents, need some attention. You know, the "red" folk love it out here. Americans really ought to know this part of the country better. And, we can use New Englanders as the main thread in order to do this. 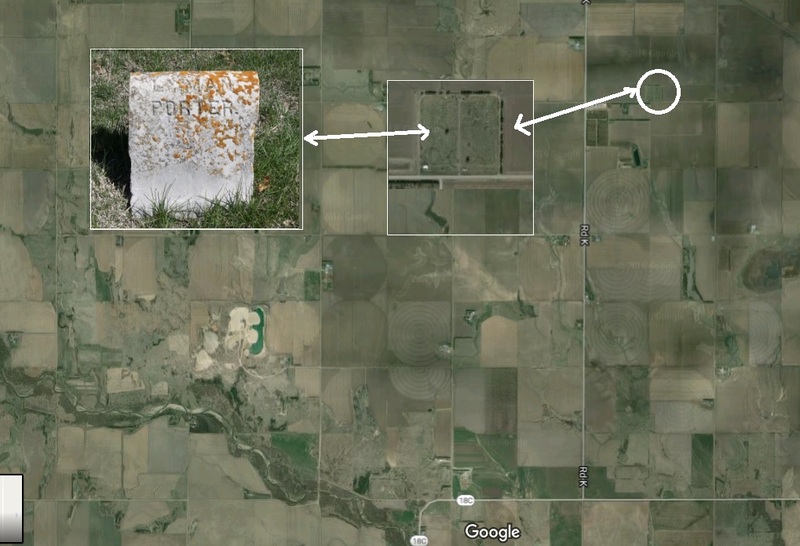 As an aside this area is near the Oregon Trail as it wound its way from Gardner, KS to the Platte River. So, this area saw the travelers going by. Lots to tell, there. Now, the grave is of a descendant of John Porter of Salem. Buried here was Lyman (d 1898) who was born in Wendell, MA (he is also a descendant of John Alden - his offspring, who precipitated the work, is also descendant of old guy Brewster and others). Why, and how, Lyman ended up here is a story that will be told, in part, in the next issue of The Gardner Annals. 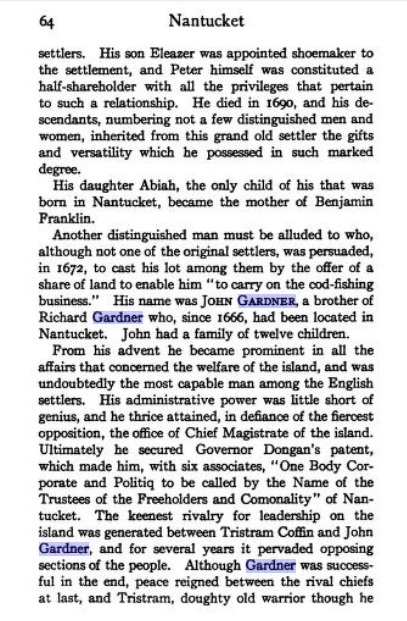 The story has more appeal in that his children represent a merge of lines from northern and southern New England (that part which we know as Virginia and its neighboring states - see Albion's Seed). This happened post the revolution, however the Virginian folk were from the very early times, to boot. In this case, the joining up was via Kentucky. In terms of the Society, Lyman's ancestor (Joseph) married a daughter of William Hathorne. Joseph's brother married another daughter. These two lines merge in a descendant of Lyman. 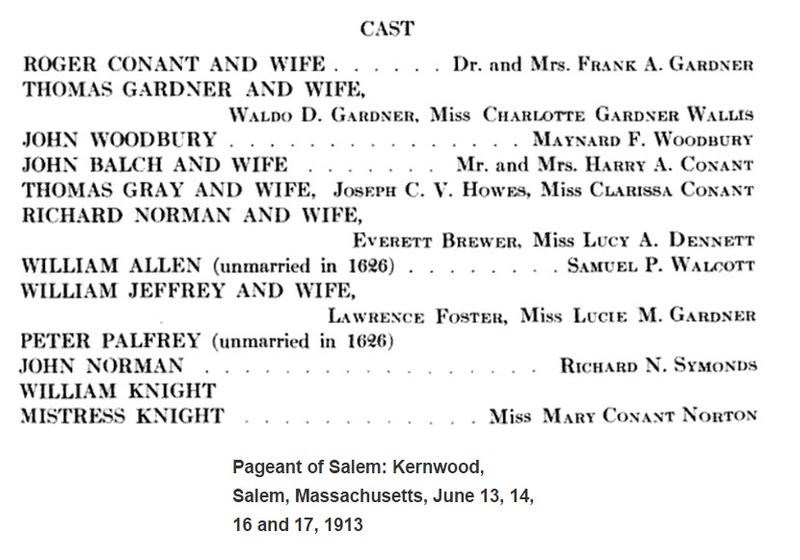 As well, one of William's sons (Joseph's brother-in-law) married a granddaughter of Thomas Gardner. That couple gave us Nathaniel Hawthorne. 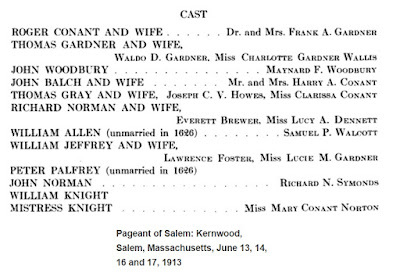 Joseph's sister married a granddaughter of Thomas Gardner. 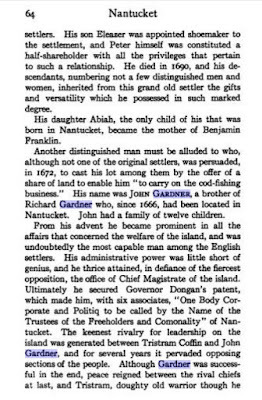 Joseph's niece (daughter of his brother) married a grandson of Thomas Gardner. And, this is not the whole shebang. So, you see, all of this relates from the beginning to what we are interested in. And, that little bit is only one of several other (actually, very many) threads that we can follow. Before, we mentioned the long arm of New England. Lawrence, KS ( Final migration, remember that, Jayhawk'ers) was formed in order to bring anti-slavery settlers out west. There were armed Quakers out here having fun. There were Quakers in Virginia (and other southern states). In short, a whole lot of American History was not (has not been) told, properly. New England researchers can help fill in. So, we get a chance to add to the mix. And, having these long threads of 100s of years are going to be important. All along, new folks were coming in, just as we see now. So, the fabric of the American people is a lot more than has been described. Aside: I have an interest due to being born in the west, having attended KU (whose students do not, for the most part, realize that their hill overlooked the major campground of the Oregon-bound trains), living all over the country, working in all aspects (government, business, non-profit) of our economy, seeing the interplay twixt us and the world (especially Europe), following the mischief of finance, and then falling into the opportunity to see the fleshed version of the long American experience. It is interesting that Lyman's brother is already in the Mayflower organization roll. Too, one of his daughter's is in the roll. The thread that we researched was the eldest daughter of Lyman and his wife, Caroline. That daughter (d 1872) is the 3rd-great-grandmother of root of the thread being used for the study. 11/22/2016 -- Discussions (questions) on another forum brings up just how much this relates to the red/blue split that is dividing the country. So, we need to get to that, at some point next year. 12/18/2016 -- Article published in The Gardner Annals, Vol. III, No. 1. While reviewing post activity, we noticed that one of the summary posts had been recently of interest. The image shows a snap from the page that was taken today. We usually do these as a summary around the New Year time but wanted to start early. This has been some year all around. The image shows the order in number of reads for the past 30 days. Here are the titles with date of original publication. Several are from last month which is to be expected. The prior posts are from much earlier. Doing this type of review gives an opportunity to see if some corrections need to be made, or, more usually, to determine whether or not some new information might need to linked in.